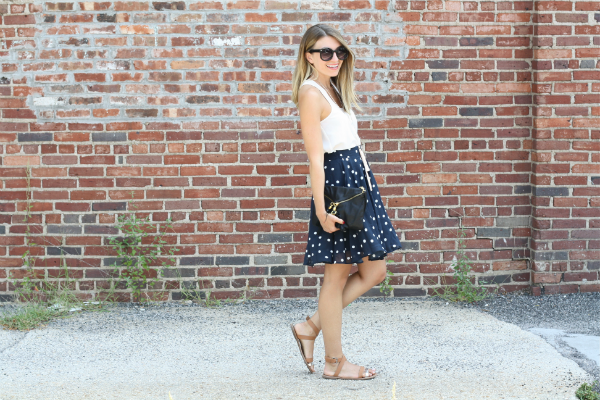 Polka dot prints are one of the most versatile patterns. 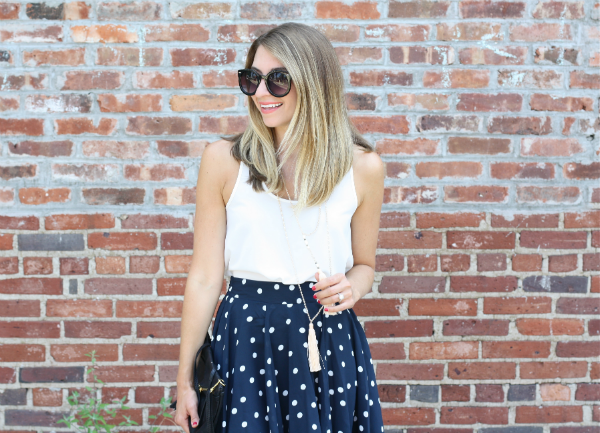 No matter the size of the polka dot, the print always creates a fun and playful look. For this outfit I chose to add some dimension with a sleeveless blouse and beaded tassel necklaces. With such a statement print, I didn't want to over-complicate the look by adding a top with too many details. I am, however, a huge fan of mixing prints and truly believe this skirt would pair really well with a striped tee or even floral print. When mixing prints the key is to choose prints that have similar colors to create overall cohesiveness. I am so ready to pair this skirt with a chambray top and a big chunky statement necklace for fall. How would you style it up for the new season? You look perfect! I love that skirt, and the tassel necklace is super cute! Can you look any cuter babe? I love this darling look on ya. Skirt is adorable! You look amazing dear!!! love that skirt!